When I started out this blog, one of my main focuses was controlling my oily skin, and I've been keen to try lots of different products, from a wide range of brands, that are aimed specifically at tackling this issue. 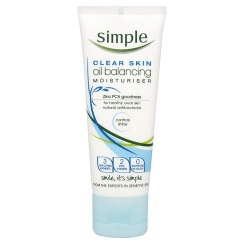 From past experience, I've become quite fond of Simple's Oil Balancing Range, having tried their Facial Wipes and Exfoliating Facial Wash, so when I ran out of my trusted Neutrogena's Visibly Clear Oil Free Moisturiser, despire being really quite fond of it, I decided to give Simple's Oil Balancing Moisturiser a shot. Active ingredients Zinc PCA and Natural Antibacterial. After cleansing, no matter what your skin type, it needs daily moisturising to keep it nourished. Eliminate shine and maintain moisture levels with our Oil Balancing Moisturiser which keeps your skin looking fresh and healthy. 100% Shine Free mattifies all day long. One thing that I always appreciated about Neutrogena's Moisturiser, was the fact that it has a thin nozzle for distributing the cream. The nozzle meant that I didn't squeeze too much product out (which I often accidentally do). Unfortunately, the Simple Oil Balancing Moisturiser doesn't have such a small nozzle, and I find myself unwittingly putting too much product into my hand. As a result, I find that the moisturiser doesn't really balance the oil on my skin, but seems to make it worse, making my skin look shiny and feel disgusting. As a result, I've taken to rubbing the cream in my hands before applying it to my face, which is a little bit annoying. But, it leaves me missing the nozzle of Neutrogena's. Another issue that I've had with this moisturiser, is that it smells really bad. I didn't actually notice it, until I started using it after another product, that smells of oranges, which seemed to bring the foul scent out even more, but now I've noticed it, it really bugs me. £3.99 isn't too expensive, and it does seem to last a long time. No, but only because I've found myself preferring Neutrogena's moisturiser, which is unusal since I normally choose Simple over any other brands!